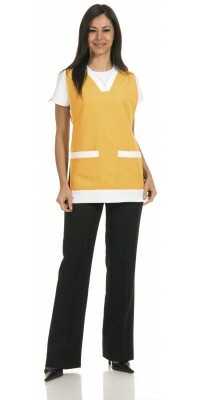 Tunics and Ponchos There are 20 products. Poncho-shaped apron, model Europa shirt collarBlue colourImmediately available for delivery: size S - L Made of Satin Gabardine, 50% Cot., 50% Pol. Women's short-sleeved tunic, model Barbarashirt collar and covered buttons Blue colourImmediately available for delivery: sizes from XS to XL Made of Satin Gabardine, 50% Cot., 50% Pol. Poncho-shaped apron, model Europa shirt collarPurplish Red colourImmediately available for delivery: size S - L Made of Satin Gabardine, 50% Cot., 50% Pol. 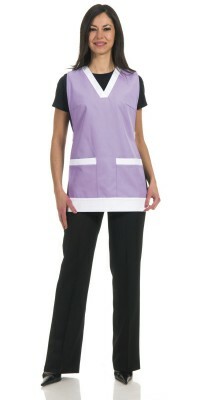 Women's short-sleeved tunic, model Barbarashirt collar and covered buttons Purplish Red colourImmediately available for delivery: sizes from XS to XL Made of Satin Gabardine, 50% Cot., 50% Pol. Poncho-shaped apron, model SiriaV-neck and two side pockets Ochre colourAdjustable one sizeMade of Ines Gabardine, 65% Pol., 35% Cot. Poncho-shaped apron, model SiriaV-neck and two side pockets Lilac colourAdjustable one sizeMade of Ines Gabardine, 65% Pol., 35% Cot. Poncho-shaped apron, model SiriaV-neck and two side pockets Mint colourAdjustable one sizeMade of Lightweight Soft-Feel Gabardine, 50% Cot., 50% Pol. 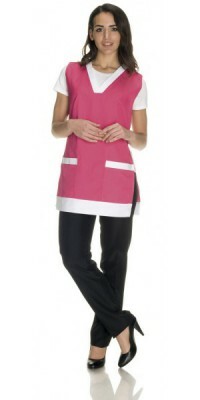 Poncho-shaped apron, model SiriaV-neck and two side pockets Fhucsia colourAdjustable one sizeMade of Lightweight Soft-Feel Gabardine, 50% Cot., 50% Pol.